One & Done reveals a simple strategy of purchasing one property in order to achieve one million dollars in profit in a matter of 10 years. The opportunity is massive. Read this book and discover a unique approach to investing in Toronto that is based around creating a luxurious turn-key triplex, providing you and your family with a healthy nest egg and peace of mind. One & Done come with over $497 worth of free gifts. 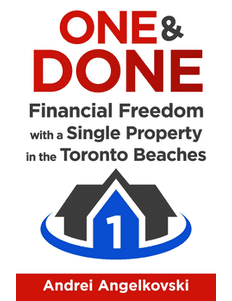 • Download my previous book, “One, Two, Free: Financial Freedom through Real Estate Investing in Toronto” for additional current real life examples, the beach retirement plan, and for a lot more statistics and valuable information about the Toronto Beaches and its surrounding area.